The two-part seat offers first class supersport ergonomics with perfect support for rider and pillion. With a seat height of 820mm enables the rider to have a secure stand while also being high enough for sporty use and real big-bike feeling. The clip on handlebars and switches contribute to a sporty and aggressive riding position combined with advanced control. A steel fuel tank with 10l capacity (including 1,5l reserve) has been developed for the RC, perfectly matching the supersport style and vehicle design, together with rider ergonomics. 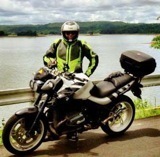 Thanks to the economic engine, the RC achieves even in the sportiest manner of riding a considerable range. The advanced design windshield in combination with the aerodynamic optimized motorcycle front ensures incredible wind protection for rider’s chest and arms. The brand new bodywork, footrests and pedals not only provide a unique supersport look but also help the RC to master extreme cornering by allowing a greater leaning angle. As a special feature, the RC incorporates blinkers into the mirror structure, which not only look sporty but also contribute to the perfect aerodynamics. 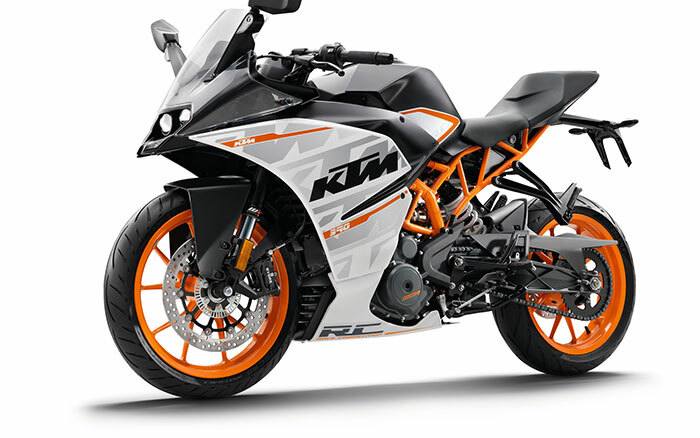 Fitting perfectly into the pure racing look, the number plate holder rounds KTM’s high performance bike off. The state-of-the-art, liquid cooled, single-cylinder, four-stroke 375ccm engine with twin overhead camshafts, four valves and electronic fuel injection, already equipped in the Duke 390 provides outstanding power and thanks to the balancer shaft, delivers the highest level of smoothness. Because of the KTM-typical compact design with stacked transmission shafts the engine has an unbelievable low weight of 36kg. Combine that with technical details like a forged piston, Nikasil-cylinder-coating and forced feed lubrication with power-promoting body-evacuation and you get an engine which provides a remarkable 44hp. The engine is equipped with an electric starter powered by a 12V/8Ah battery. KTM in cooperation with Brembo developed a powerful, excellent to dose brake-system which allows the rider to be always in full control of the RC. A four piston radially bolted caliper in combination with a single brake disk (300mm diameter) in the front and a single piston floating caliper with a single brake disk (230mm diameter) for the rear wheel guarantee excellent breaking reaction even in the sportiest manner of riding. I just saw one of these on the road this morning. Solid cool. After all, is there a more desirable-looking 400cc street bike out there? 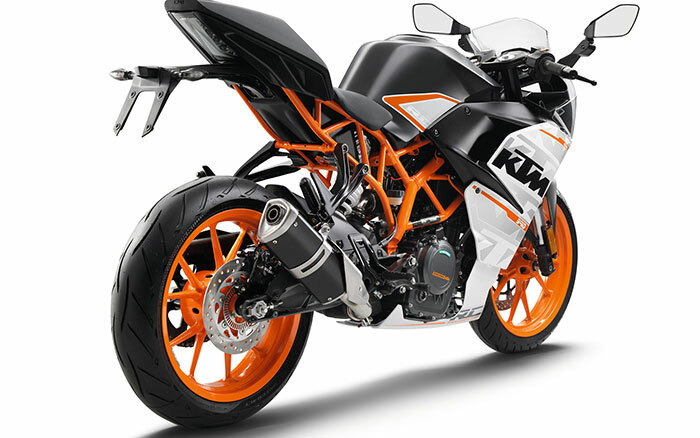 Really like the contrasting KTM Orange colors on the frame and the rims with the black/white fairings. I'm starting to see more and more manufacturers get "braver" when it comes to picking bike model colours. It's good to see from a few years ago the choices were so, blah, (solid black, solid white). I think the manufacturers are starting to realize that riders actually want excitingly coloured models! After all, we don't want to ride a Toyota inspired bike do we? Oh yes, back toeh RC390. Great idea, I'm sure this will blow away the Kawasaki 300 and Honda 300R competition, but as usual, KTM's are a little on the high side, which is odd, as I've never considered KTM to be more than a "premium off-road" bike...Will have to see how their street bikes hold up in value. Notes: Like the Big Daddy Jack burger* "Looks Good!!! Tastes Great!!! But not Less Filling". If you are in the market for a small but meaty bike that not only looks delicious but will make you the Mack Daddy at bike night you just found it. * Hmm, looks like I might be hungry. lol. Get excited as the next TMW Cool Wall bike for 2016 is now up for voting and discussion, have fun!